I have thrown out (read that, recycled) piles of files during the past two weeks. One I kept, though, was a Shakespeare file. Reputedly, Shakespeare invented words by changing verbs to adjectives, adding syllables or even coining new words. Here is a short list. Add vowels only! Want more Shakespeare? Last April I write about Shakespeare’s birthday in my classroom. Find the other link here. Add some coined words I’ve missed, another Shakespearean quote, or even a thought about April and spring-cleaning. I love words. Share some of yours here! What a fun Shakespeare post, Marian! I will have to go through it more and your links later when I have more time. A few weeks ago, my husband said he \”felt so cultured\” because we had recently seen \”Macbeth\” and \”Hamlet.\” We\’re seeing \”Rosencrantz and Guildenstern Are Dead\” next month–same cast as the Hamlet production we saw. You live close to good theatre. Enjoy it all! We have subscriptions to two different theatre companies in Philadelphia, and there are also others performing Shakespeare this season. It\’s just a coincidence. There seem to be a few ancient Greek themed plays next year. Perhaps if there are other teachers who might like some of your material? Good question, Merril. I had taught English Lit for many, many years and had tons of folders. 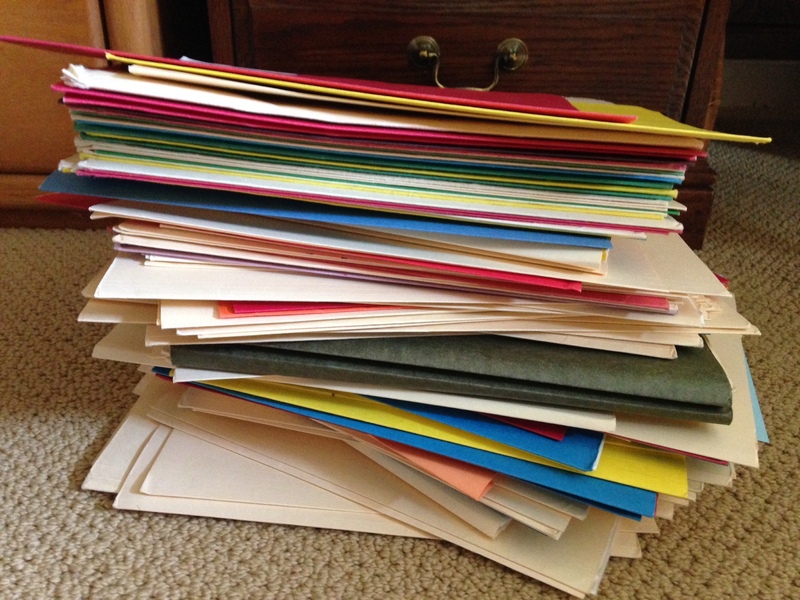 Before I retired, I had an open house in my office and invited my colleagues, most younger, to take any folders they wanted. I have a photo of one of my dearest friends sitting on the floor in front of my file cabinets sifting through material. What I had left was what I recycled. In Vancouver I attended Bard on the Beach with some very good friends every year for 20 years. I loved every production with the sea in the background it was magical. I can´t say which is my favourite. We use the Bard´s quotes everyday and don´t even realize it. Happy Birthday Mr. Shakespeare!! Darlene, nice to hear from your corner of the world. I would imagine the sea would be a topnotch background for production of The Tempest. \”Bard on the Beach\” has a nice ring to it. Marian — Oh how FUN! And while I didn\’t get an \”A\” (not even close), I did fair — a pleasant surprise for a test taken while still in yoga clothes this morning. 4. Nobody knows what Shakespeare did between 1585 and 1592 — those years are unaccounted for. 6. WE probably don’t spell Shakespeare’s name correctly ‚ but, then again, neither did he. 8. Shakespeare wore a gold hoop earring — or so we think. Those yoga poses really aerated your body and mind. Thanks for posting the trivia here, Laurie. About # 10, some of my students wanted to write research papers proving that Shakespeare didn\’t really write the plays attributed to him. I usually tried to talk them out of it suggesting focusing on the meaning of his works instead. Nevertheless,that guy certainly knew how to Shake-A-Spear. There was usually a high body count at the end of his tragedies. T. S. Eliot who once said, \”April is the cruellest month\” was probably looking at snow falling on flowers. April, it seems, can\’t make up its mind about what to do weather-wise. My consolation to you: May – September! This is a good place to vent, Anita. Thanks for reading and commenting just now. What great fun a Shakespeare quiz…I have a date with it on Sunday afternoon , my nothing in particular day. Before we moved to the delightful country of Wales 7 months ago , we lived an hour from Stratford and would go to see productions regularly . One of the first we saw was \’The Merry Wives Of Windsor \’with Leslie Howard …it was brill. The language is beautiful , however, difficult to understand till you get to grips with it . A comedy is a really good way to start because you first see the animation first , then absorb the beautiful poetic language . I\’m impressed, Cherry. Your connection to the bard is both geographical and literary. I like plays too because the body language and tone of voice fills in what the lofty language sometimes disguises. See you this weekend! Thanks for this fun post (but methinks I do not have time this day to entertain myself thusly). Fake Shakespeare? Thanks for giving me the first smile of the day, Melodie. I believe I have read something Michelle has published before and I do follow her on Facebook. Now I\’m off to check your link. A daughter to be proud of – in the genes of course. What a fun post. I do love Shakespeare and was brought up on his works. I\’m certain you could add a line or two to the quotes above. \”Brought up on his words . . . !\” Impressive – I\’ll bet you had good teachers too from the land of Shakespeare. Wow, Shakespeare. I do like that poem about him above. Thanks for stopping in today, Ms. Monologue. Looks like no one took the quiz bait, Marian. I got about half of them without looking them up. I think you must have been one fabulous professor. Lucky students and colleagues. I only ever taught Shakespeare once, when I taught high school English. My college teaching focused on American Lit. But, of course, all writers owe a debt to Shakespeare. Have you been to the new Globe Theater? You\’re so funny, Shirley! Methinks some of my readers took the quiz in reverse, answers first – questions second. No, I haven\’t been to the new Globe. It needs to go on my bucket list. Two words I like: quotidian (a most uncommon word for \’ordinary\’), and schdenfreude (taking delight in another\’s misfortune). Marian … I do love Shakespeare and Brit Lit (took two courses in college and loved it). But I found it very challenging to teach his \”Sonnet 43\” to 7th graders. We had far less trouble with \”The Song of Wandering Aengus\” by W. B. Yeats. I know you do love words and word play, Judy. Schadenfreude is of German origin, but I suspect you know that already. Yes, I looked it up – and am extremely happy to honour him as you have Marian .. thank you. Susan, if anyone deserves a break staring out at the sea, it\’s you. I admire all of your hard work on the A-Z dream sequence this past month. Now I\’m wondering what you have chosen for the letter X. You are a literary lover, so not surprised you enjoy Shakespeare. What a fun, entertaining post Marian. Literature\’s equivalent to a crossword puzzle! I\’m glad you enjoyed it, Debby. Judging from the views when the post first came out, I\’m guessing most readers waited until the answers were published. Ha! I\’m a Shakespere fan. A few years ago I was lucky enough to watch a performance of Hamlet at the Globe Theatre in London. There really is nothing like it. We stood near the stage and the actors rushed past us to take their places. We really felt as if we\’d seen it performed as it would have been when Shakespere was alive. All I could think about when I read your lines was, Lucky you, lucky you. It\’s not Shakespearean but it\’s the truth. Thanks for checking in today! You\’ve heard the expression, art imitates life. Well, the actors rushing past the audience would be a good example. I\’m assuming you are speaking of the \”new\” Globe reconstructed in 1997. Yes, I\’d love to see a performance there.